TweetDeck has been Twitter companion ever since @MattJabs convinced me to try it. I was a great fan of @Twhirl until then but the dashboard like Twitter interface lets you track so many accounts in columns at once. Plus, TweetDeck also has a free iPhone app that again syncs the columns and accounts with your desktop counterpart. One of my gripes with Tweetdeck was the inability to see my recent followers. New notification system – optionally choose the position of the notification window in one of four corners of your screen. And you can retweet, reply, favorite right from the notification window (Digsby anyone?). Plus you can set notification options for column by column basis! TweetDeck is THE BEST twitter desktop client IMHO. It continues to evolve and the developer has his ears open for the users’ request and responds to them with timely updates. 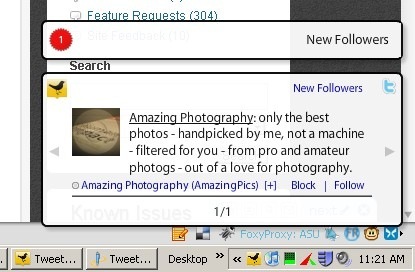 If you have stuck to the web interface of Twitter so far. I highly recommend trying out a Twitter desktop client like Blu or TweetDeck or even a professional web twitter client like HootSuite. I started enjoying tweeting more after I switched away from the web based Twitter. 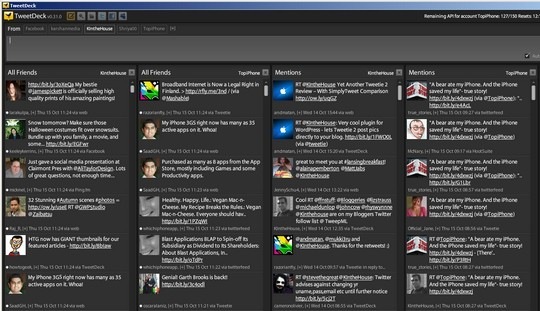 TweetDeck has become very popular due its connectivity and linking system with facebook and etc. For me the TweetDeck is my best online buddies because the notification was really fantastic and I never missed one in my online friend updates. I do wish the iphone app of tweetdeck supported the new followers column. Any idea when that might happen?